Defence (Milipol Qatar 2018). Sayyid Hamoud bin Faisal al-Busaidi conveyed the greetings of Sultan Qaboos bin Said of Oman to the Amir and his wishes of further health and happiness, and to the people of Qatar further progress and prosperity. The Amir reciprocated Sultan Qaboos' greetings and conveyed his wishes of more progress and prosperity to the Omani people. 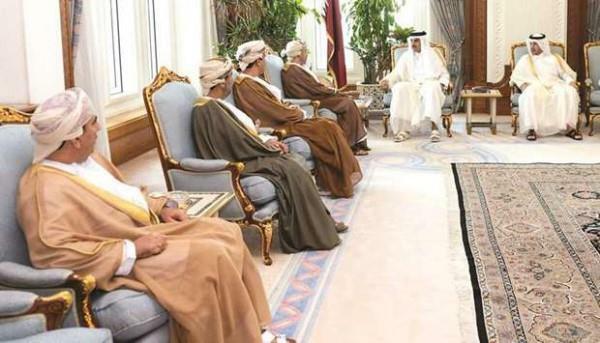 The meeting reviewed the fraternal relations between Qatar and Oman and the means of developing them. The meeting was attended by HE the Prime Minister and Minister of Interior Sheikh Abdullah bin Nasser bin Khalifa al-Thani.